Alzheimer’s disease (AD) is a progressive neurodegenerative disorder that remains one of the major burdens on our society with no available cure. AD in combination with vascular cognitive impairment (VCI), represents over 80% of the total dementia cases. Curiously, at autopsy the overlap of the underlying pathological hallmarks of AD (beta-amyloid (Aβ) plaques and neurofibrillary tangles) and VCI (strokes, small vessel disease and vascular dementia) is very obvious, but often unrecognized in the clinical setting. Hence, we are focused on the basic research of the comorbidity states of AD and VCI to investigate underlying disease pathways as well as potential biomarker profiles. 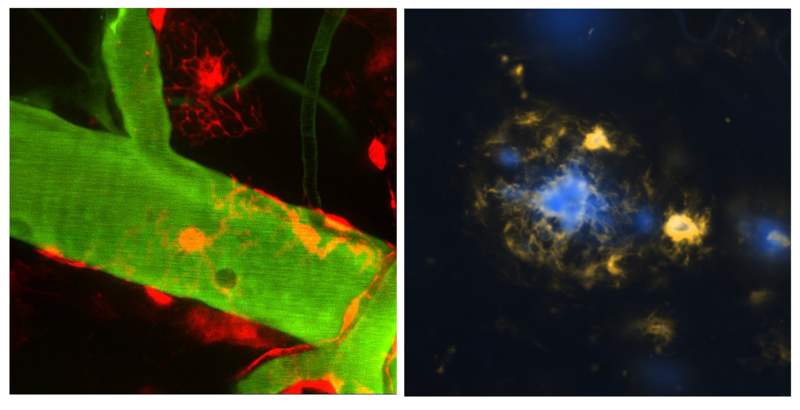 Using various state of the art techniques such as 2-Photon imaging, RNA sequencing and primary cell culture models of the blood brain barrier to investigate pathological alterations of the comorbid states. The neurovascular unit is of particular interest to us, as it is impacted by both pathologies and hence creates a common link between the diseases. Close collaboration with clinicians enables us to work in a translational setting and to validate our findings in human samples. The overall goal is to investigate the long-term interplay of the two pathologies and to identify new molecular mechanism leading to alterations of the neurovascular unit as well as potential new disease markers.